Raku has many variables and each time we fire we learn a little bit more about which elements produce certain results, but there are still many things we can’t control. A lot of these unpredictable elements occur when the pot leaves the kiln and is placed in a new environment, the metal can. We then toss handfuls of wood chips to ignite the flames and swiftly place the lid on top to starve the piece of oxygen. This is where we can achieve the metallic lustre you see on many of our white crackle raku pieces. this along with the thermal shock, which creates the crackle effects are beyond our control as to where the patterns and colors appear. Sometimes the shape of the piece or where the pot was placed in the kiln effects the way the crackles caress the pot. Raku has been a favorite process of mine since college. I remember the thrill of firing multiple pieces in the exact same glaze and pulling them to find them all as unique as a finger print and sometimes completely different in color. Raku can be equally as disappointing when it does not turn out. It can be matte and scratchy with a charred look or the glaze can run, gluing the pot to the shelves. It is not uncommon to lose multiple pieces each firing to deep cracking or breaking during the process of removing them from the kiln. The redeeming part of the process is when something accidental happens and creates a unexpected result. For example, Joe and I often fire during the winter in the snow, as you will see in these photos. One time when we were firing, we accidentally dropped a glowing hot pot into the snow as we were pulling it from the kiln. Joe quickly picked it up and put it safely into the barrel. After we finished cooling the pots we realized that the snow had made a beautiful and intense crackle effect, leaving the pot almost black where the cold snow had kissed it. 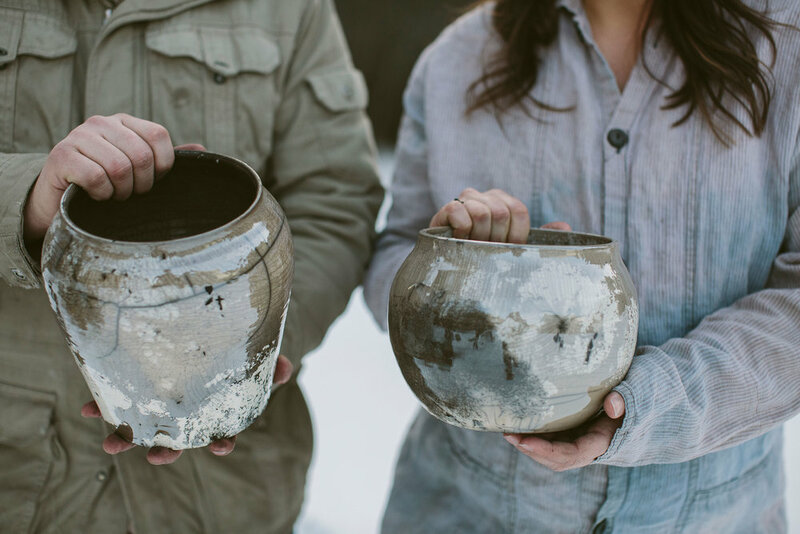 The raku process is done outside due to the firing process and the smoke that it creates. We fire our pieces down the road from our studio on our friend’s land. 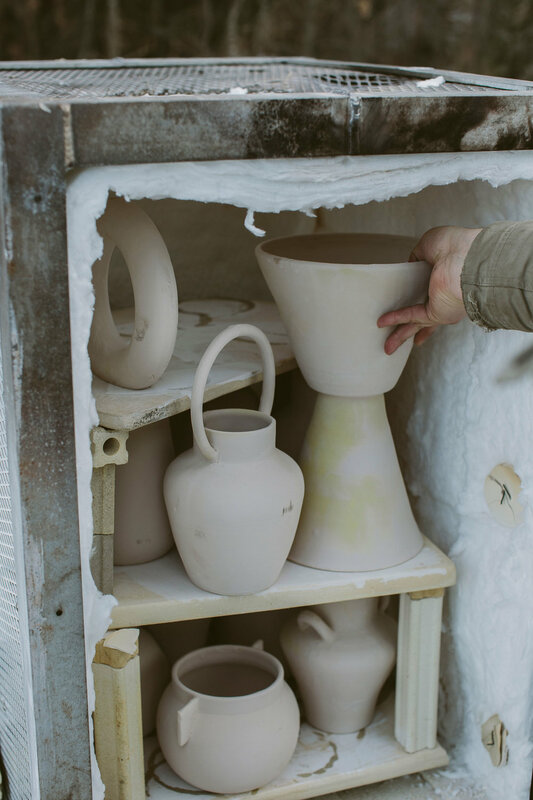 The Pots are fired once at the studio, which is called a bisque. This Makes the pieces more durable and porous so that they can absorb the glaze. We dip them in the white Crackle glaze, fully submerging them and then shaking off any excess glaze. Once the pots have dried we load them into the kiln and turn on the gas. It takes approximately 90 minutes for the pieces to reach temperature and for the glaze to melt. At this point we shut off the kiln and remove the pots from the kiln using metal tongs and place them in a barrel full of wood chips. We sprinkle handfuls of wood chips over each pieces to pad them from the next piece and prevent them from sticking together because the glaze is still slightly tacky at this point. The goal is to fill the barrels with a few pieces and cover them with the lid as quickly as possible. Once all the pieces have been pulled from the kiln we go back to the first barrel and burp them. Burping is simply opening the lid and fanning it to reignite the flame. This sometimes results in a fire ball which can be quite exciting. Once the fire is relit we close it up and let it smolder a few more minutes. We then pull each piece out and submerge them in water to cool them off. Once we get the pots back to the studio we give them a bubble bath and let them air dry. The pots smell a lot like a campfire (which is so on brand for us;), so cleaning them and letting them air out for a couple days is necessary so that we don’t stink up the shop.